Where to Buy Image Herbicide Kills Nutsedge, Image Herbicide Kills Nutsedge - 24 Oz - $22.95 for Sale with Fast Free Shipping! Image Herbicide Kills Nutsedge - 24 Oz is a postemergent, selective herbicide for use on southern turfgrass and selected ornamentals. Its patented formula starves weeds to death. IMAGE Nutsedge Killer targets the toughest southern weeds like Yellow & Purple Nutsedge or Nutgrass, Wild Onion and Garlic, Dollarweed, Field Sandbur, Ryegrass, Crabgrass, unwanted Bahiagrass, White Clover, Henbit, Chickweed, Annual Bluegrass, Virginia Buttonweed, and Dandelion. "IMAGE Nutsedge Killer Starves Purple & Yellow Nutsedge to Death! 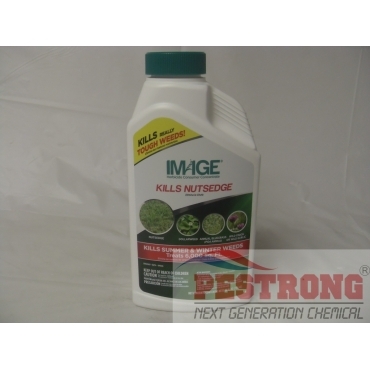 IMAGE Nutsedge Killer is labeled for use on Bermudagrass, St. Augustinegrass (DO NOT APPLY TO ST. AUGUSTINE FOR WINTER WEED CONTROL), Centipedegrass, and Zoysiagrass. IMAGE Nutsedge Killer can also be used effectively to control tough weeds growing in and around many ground covers and ornamental shrubs. Applying IMAGE Herbicide is easy and requires little cleanup. You can use IMAGE Herbicide for spot treatments with a trigger or pump up sprayer or treat large areas with a hose end sprayer. When using IMAGE, you should expect to see weed discoloration in 1 to 2 weeks and dead weeds in 3 to 4 weeks. IMAGE Herbicide can be applied using a hand-trigger sprayer, pump-up sprayer or hose-end sprayer(Dial'n sprayer). economic weed killer...I like it.